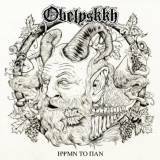 Bavarian doomers Obelyskkh have only been going five years, and Hymn to Pan is their third album in three years, which suggests either over-confidence or lots of ideas! It's a pleasant surprise to find both here, good ideas produced with confidence, and Hymn to Pan is all the better for it. Sounding roughly something like a slightly less drugged-up Electric Wizard, Obelyskkh are so good at the doom metal riffs that make up the spine of their music that the additions fit in well around it – and a lesser band would not be able to implement said range of additions so well. Not a single song is under eight minutes and the longest is over twenty-three minutes, so this is a lengthy trip of an album suited to experienced doombahs who like losing themselves in songs. And there's a lot to get lost in! The opening title track is the most immediately unusual, building up with birdcalls and distant horns, droning riffs and a slow drumbeat that launches suddenly into a solid stoner pounding. It dies away into a droning, clean-sung and almost ambient section, building up again with some gorgeous psychedelic rocking. Excellent stuff that swallows the ten-minute length up easily and makes you want for more, and more is on the way with The Ravens, a relatively straightforward rocking doom track where vocalist 'Crazy' Woitek gets to really go to town on his Jus Oborn impersonation. Thankfully the guitars are so compelling and doomy that you don't focus on that minor point, and the closing unaccompanied piano is a nice touch, classy and almost proggy. The sampled voices on the following The Man Within have an altogether more murderous tone, reminding me of Church of Misery's serial killer doom, especially due to Woitek's shriek-ier vocals. The following Heavens Architrave opens with nearly a minute of pure ambience, a melodic strum the heralder of a more technical track that takes as much from post-sludge as it does classic doom at first, moving into an enjoyably swinging riff towards the end. Horse begins with rattling glass bottles and a creepy old woman, before moving oddly forwards complete with mid-track breakdown and sampled cheering – the most conventionally sludgy track present from the riffs alone, let alone the howling vocals. And closing Revelation: The Will to Nothingness, in all its twenty-three minute glory, is excellent, starting with a rocking sludge tone and proceeding to mellow out for some blissful, almost spaghetti-western strumming. The band kick back into a deliciously slow doom churn, a sample of a man repeatedly saying 'I've murdered somebody' and lots of feedback. It's a great end to a great album – everything about Hymn to Pan, from the bass tone to the riffs to the drums to the songs, is excellent. Highly recommended for doomsters.